The GREENBRIDGE Solutions concept is based on the merger of various partners with, in some cases, up to 15 years of experience in the field of renewable energies and the wind industry. To do justice to the developments and growing requirements of the market on a national and international level, it nowadays appears sensible to produce a maximum benefit for our customers as a result of optimised communication and service structures. By making use of various synergisms and competences, increasing efficiency and sustainability is the objective of our service in this context. This year we are also pleased to welcome you as an exhibitor at the "Energie" in Hamburg. We hope for stimulating discussions and constructive cooperation. For more details please see news. 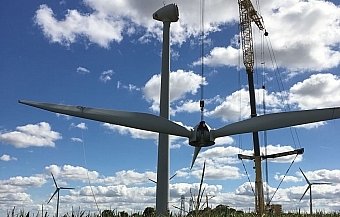 We are delighted to announce today that we are one of the first service providers able to carry out major components as well as many other repairs to Enercon systems and have successfully completed them in several pilot projects. The latest project took place in France, below a few impressions. Our extensive portfolio of inspection, review and service performances makes it possible for our customers to have a clear overview of the condition of individual components and also the entire WEP at short notice. Thanks to a competent and experienced project management, we combine individual areas such as logistics, crane and loading supports, supply management and extensive teams on site to form the most cost-optimised interaction possible. Extensive concept approaches in the part areas of value-added renaturation, logistics and storage as well as sales and marketing make it possible for us to represent the interests of the customers in question expediently. Here you get an overview on available plants.